Don't let an injury ruin your next outing. 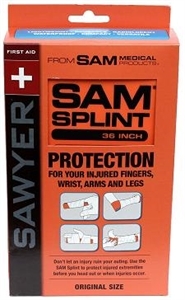 The SAM Splint™ is built from a thin core of soft aluminum alloy sandwiched between two layers of closed cell foam. 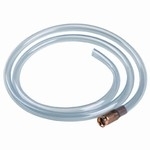 Bent into a simple curve, it becomes extremely strong and supportive for any injured limb. The SAM Splint™ is lightweight: transportable and easy to pack and carry (4oz), Flexible in application: One device immobilizes nearly any bone in the body, affixes with any tape or wrap. Reusable: Wipes clean and easily re-shapeable for another application. Kit includes: 1 Regular Sam Splint, Training DVD, Wrap, 2 Finger Splints, Tape Strips and Quick Reference Card.